Here is another run of the News from the Windows Store. First my sincere apologies for missing the news run last weekend, I just couldn’t catch a break, had to go native and please the family. Coupled with an absorbing project at my day job you can understand my spottiness also online, via Twitter etc. So here we are two weeks after General Availability, as Microsoft love to call their public deployment of their wares, and the Store is still waxing strong. 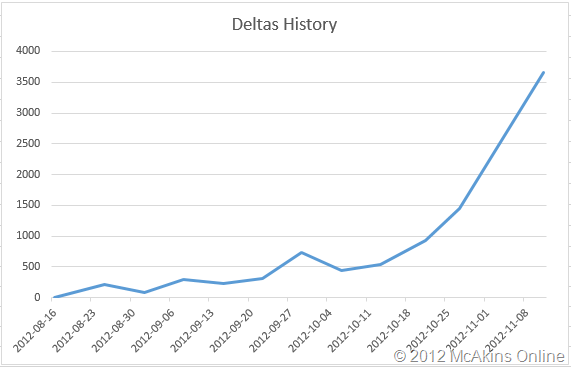 As you can see from the Stats above, we grew 3656 apps in two weeks. Divide that by two and you have the per week number. Question is can Microsoft keep this momentum up? Time will tell. You can also see the exponential growth on the graph. Funny thing is, there are bonehead bloggers out there bad-mouthing the new platform for lack of apps. There you have almost 10000 apps, and how many does an average person have on their device again? Of course you can argue most them are chaff, yes, so it is with all App Store that I know as of today. Its all about Quality Apps. 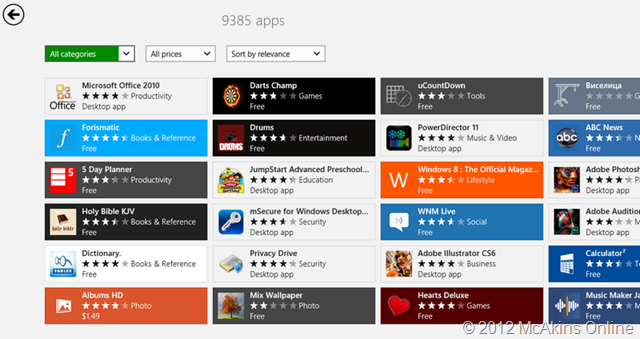 There are quality apps in the Store right now and more are still coming. I will not burden you by listing all apps that debuted these past two weeks, but the Quality ones you will see I have already blogged on this blog, and the other that are worthy of mention are listed here below. I am sure you’ll find something for yourselves in the list. In the category of news is the return of the Trackage app in the Store, it was pulled for some reason, now it is back. 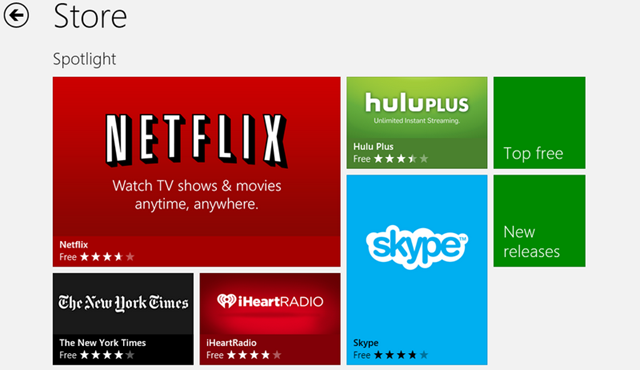 Also HP has decided to make their Windows 8 Introductory Demo app available to everyone. You can now download the app in the Store on all devices and not only on HP devices anymore. Flixster also made news this week by releasing a major Update that fixed most issue with the app. I refused to blog/mention the app because of various issues with the app. Now, the app is fully usable so you can go download it. My personal favorite this two weeks have to go to the two Apps released by Telerik in the Store. Please see my post about them on this blog. Talking of Chaff in the Store, have you also noticed that our friends from India own the Windows App Store? There are more Apps from India than every other localized countries combined in the Store. The Windows Store is in this way of much more value to someone from India than any other part of the world. This should be an incentive for other countries to catch-up. Let kids learn to code for crying out loud! Anyway, the number of apps now in the store has reached an impossible level that it is humanly impossible to be mentioning each app. I am now very selective in what I blog or mention, so if you see me blog an App here on this site, you can be sure it will be worth your money. That doesn’t mean I will not miss some apps, so please I welcome your suggestions if you think I have missed some killer app that you really love. Back on the Stats. 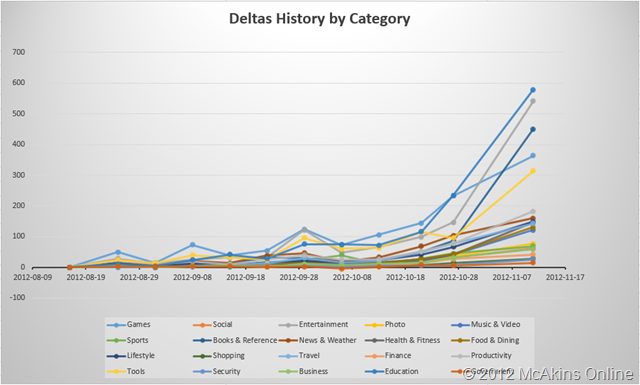 Have you noticed Entertainment and Education Categories left Games in the dust the past weeks? Simply incredible if you ask me. Education takes the crown, seconded by Entertainment and Game came on a measly third. The Education increase can be attributed to a few companies releasing books as Apps filling the Store like there is no tomorrow. Good for number chest-thumping for Microsoft, but makes it difficult to see the forest from the trees in the Store. I am still watching the Store like a hawk for the big Apps announced in the GA Keynote. ESPN is still not in the Store for example. I’ll keep you posted. Pardon me that I didn’t have time to collate the Paid/Free Apps numbers this week, I owe you one on that for next week. IM Lock Screen Slide Show– Use your Library, SkyDrive and Facebook pics as Screenlock Pics. List Master– Helps keep track of lists, useful for Students. Nasa Jet Propulsion Laboratory Feed– UnOfficial NASA feeds app. Mitt Romney– About Romney and Tax juggling. How to Make this App– Developer App showing how to create the same App. ShortUrls– Shortens URLs with 3 services and keeps history for re-selection. Anagram Assist– Solve Wordfeud, Scrabble etc like a champ. Flixster– Flixster App is now fixed by Updates. Can recommend now. Ultima 4 in a Row– A nice game you might like. MyTextTwister– Fun app to jazz up your social life and maybe bug your friends. Adobe EchoSign– Business App for document management. Booking.com– Book a room anywhere in the World. Office Depot– Office Materials on your MX Device. Kahuku– A really nice MX HTML Editor in the Store. AMD AppZone– App Center for AMD Devices. AMD’s answer to Intel’s AppUp Service. Tube Downloader– An awesome YouTube Player/Download app. Denksport – Popular Dutch Puzzle Game now in the Store. That is it for this week, I hope to be back next weekend with collated news from the Store. In the meantime, be good to one another, and have a great week ahead. Previous Previous post: Telerik delivers AppMock App in the Store for Devs. Next Next post: Does Twitter Want to Kick out Tweetro from the Windows Store?